Hey, friends! 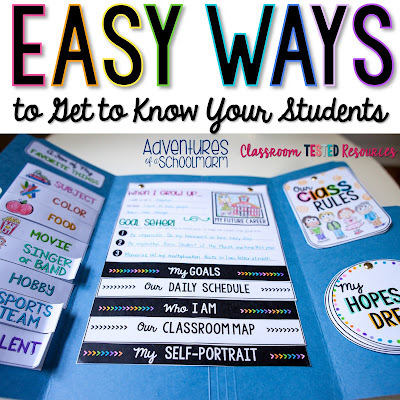 Today I want to share a few of my favorite ways to get to know my students at the beginning of the school year. I can't believe that it is almost time to go back... Can you?! I have a few friends that are already teaching again, but I officially start back next Monday. The beginning of the year is super exciting, but also overwhelming and stressful! How are YOU feeling about it? One of my favorite ways to get to know my students is to let them tell me all about themselves! I have yet to meet a kid that doesn't like to talk all about the things they love, their hopes, and their dreams. 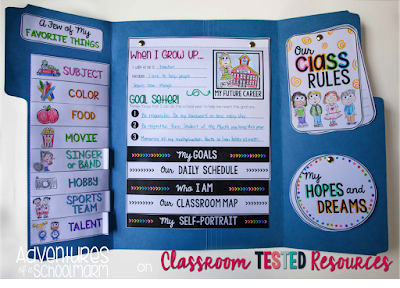 I love to have my kids write specifically about their hopes and dreams for the school year in their All About Me Lap Book. 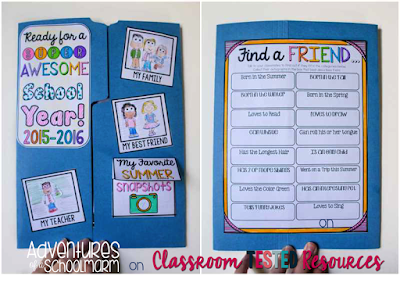 This lap book is a perfect tool to give my "getting to know you" activities a direction and a purpose. The kids love to record all the details in their official lap books. 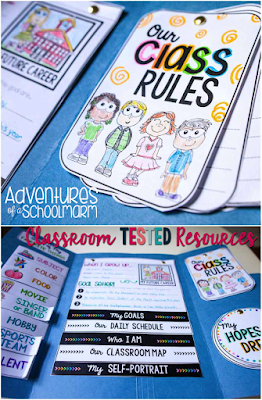 It also really helps the kids learn the class rules and procedures. I teach those through hands-on experiences and modeling, but afterwards, we can reflect and record the expectations. My favorite part about this lap book is that it makes an EXCELLENT product to have on their desks during Open House. It's not something "extra" I have to complete with the kids, but something that is embedded in our instruction the first week of school! Plus, it gives the students something really special to take home with them afterwards. 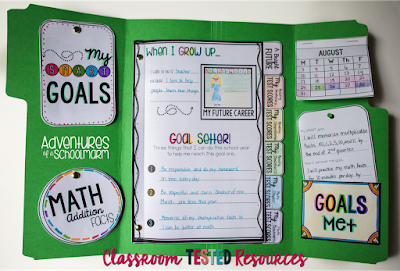 Another one of my favorite ways to get to know my students is through goal setting. I love to encourage my students to DREAM BIG, but I also want to help them learn practical strategies to help them attain those dreams. We have been using data folders in our district for the past few years to really get our students analyzing their own goals and progress. My kids have honestly thought that their data folders were kind of boring, so I wanted to spice that up! I have never met a kid that doesn't love lap booking... so my data lap book was born! I am really excited about this data lap book. First of all, it includes editable templates. 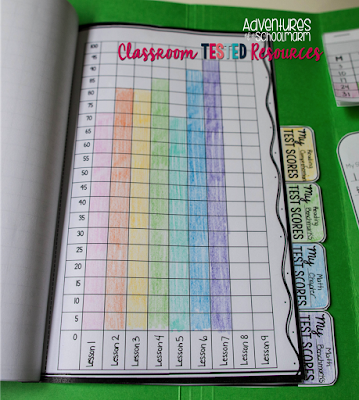 I know that everyone has different types of data to track, so this makes it a much more versatile resource to use. It includes a space on the front for the class motto and a self-portrait. Inside, it includes a variety of mini-book options for recording data. I have included space for graphing test scores, but the editable pages mean you could alter this to better meet your needs. I love that it can grow with the students throughout the year! 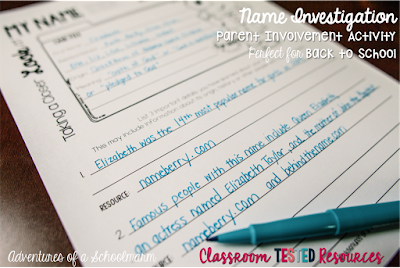 My final favorite way to get to know students is through a Name Investigation. I wrote much more in depth about how I do this activity here. 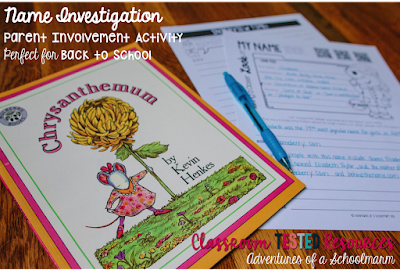 I like to begin by reading aloud the book Chrysanthemum by Kevin Henkes, then following up with the name investigation activity. It helps me teach technology procedures and even encourages parent involvement from day one! I really love how this has helped me get to know my students in the past! They always love it, too! 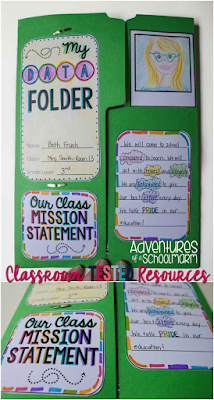 You can snag this FREE resource from my blog! 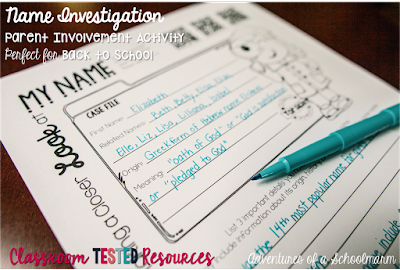 What are YOUR favorite ways to get to know students at the beginning of the year? Tell me about it in the comments below! I just love that lapbook! What a great idea for the start of the year! Thanks for sharing, Beth!